This holiday entertaining season is all about the curated cocktail cart. Luxe gold and stainless steel accessories that will make any host look like an expert bartender, cheers. Overall Product Weight: 1 lb. Pick your poison. Each cocktail pick in Viski classic is finished with a small steel ring, ideal for propping an olive in your martini or a brandied cherry in your Manhattan. Overall Product Weight: 0.01 lb. Add some global flair to your home with this stick. Overall Product Weight: 0.1 lb. 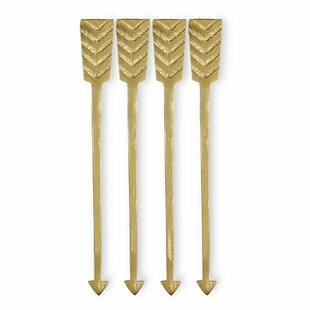 At once familiar and totally new, this stirrer picks draw on sculptural motifs from the Pacific islands. Their metallic finish adds a hint of effortless polish and sets a striking silhouette atop any tropical cocktail. Overall Product Weight: 0.03 lb. Overall Product Weight: 0.3 lb. Celebrate the golden age of Hollywood, when movies were black and white and glamour was a way of life. Is it any wonder that people are still obsessed with the classic style of Old Hollywood? Overall Product Weight: 0.754 lb. 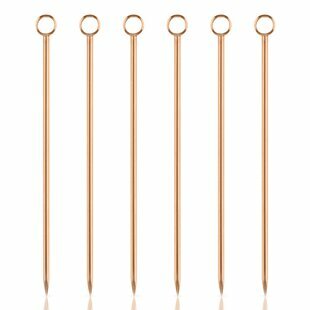 Luminous gold electroplating is polished to perfection, wrapping around each of these stainless steel stir sticks and providing an eye-catching element that is sure to brighten up any beverage. Overall Product Weight: 0.05 lb. Make stirring drinks flamboyant with their Flamingo Stirrer. A 'leg up' on the typical drink stirrer, this flock gets the party started in style. They're so much more than your average tacky yard art. Whether you're single and ready to flamingle or birds of a feather, these stir sticks do the trick. Overall Product Weight: 0.02 lb. The Pineapple Cork Caddy is great for collecting and saving your wine bottle corks. Makes a fun conversation piece and looks great on a bar or mantel. Made of durable steel with a golden finish. The cork collector holds up to 60 corks. Bottom panel open for access. Overall Product Weight: 2 lb. The essential heavyweight cobbler shaker is a carefully crafted matter of heft, balance and contour combined with utter precision in functionality. Designed exclusively by professionals for professionals, this substantial gold-plated tool is the cornerstone of any professional bar set. Overall Product Weight: 1.07 lb. Rated 4.5 out of 5 stars.3 total votes. Overall Product Weight: 0.2 lb. Overall Product Weight: 0.15 lb. Carved from premium soapstone, the whisky rocks are as finely crafted as your favorite whiskey. After two hours in the freezer, they’ll give your fine spirits a chill without watering them down. Rinse with hot water to clean and keep in the freezer when not in use. The premium soapstone glacier rocks will give your fine spirits a chill without watering them down. This heavy-duty double jigger offers long-term durability. The large portion of the jigger holds one and a half ounces and the small portion holds a half ounce. It's also dishwasher safe. Overall Product Weight: 0.13 lb. When the British and American Navies left Formosa beautiful in Portuguese, they also said goodbye to the irresistible fan girls. Wearing their trademark clingy silk evening gowns with the high leg slit the fan girls entertained in exotic night clubs. This Toscano exclusive is replicated in solid cast iron for your collection or for entertaining your own troops. 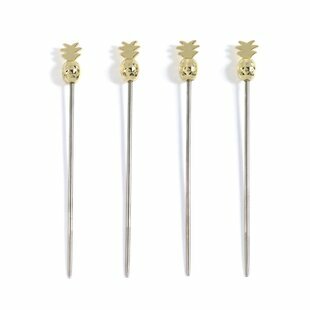 Add a colorful touch to cocktails with these charming stirrers, perfect for your next dinner party or movie night. Stir your drink in style or place in drinks to be able to distinguish which drink is yours. Choose your color and stick to it, so you don't accidentally drink your friend's drink. 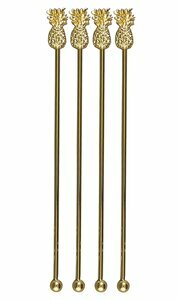 These stirs 0.75'' W x 7.88'' H. This is a set of 10 with various different color tops. Overall Product Weight: 0.26 lb. This spoon-shaped strainer is normally used with just a mixing glass when pouring drinks. Depending on the bartender's preference, the domed strainer can be used curved side up and down and holds large chunks while still allowing small bits to flow through. Some cocktails call for just the perfect amount of an ingredient and any extra can ruin all your effort. With the Visol Josset, you’ll never make that mistake again. The long handle makes this jigger easy to use. Skull trinket box with Wine Bottle Stopper is elegantly designed. Each bottle stopper is hand painted so details may vary slightly. Hand Set Austrian crystal bling accents the piece with elegance and sparkle. The stopper will arrive in a satin lined storage box making it a beautiful gift for any occasion. Perfectly design to fit one any red wine bottles and gives a perfect look in your home bar area. Comes with own stand to display in case if not in use. The bar is essential as iconic as its eponymous drink, Twine eye-catching julep strainer is intrinsic to any finished bar set. Cast in gleaming copper and gold from a classic design, this tool features uniform perforation across a bowl perfectly sized to fit standard and large mixing glasses. Overall Product Weight: 0.12 lb. Overall Product Weight: 0.24 lb. Rated 4.5 out of 5 stars.59 total votes. Modern with a touch of class, 5 Piece Cocktail Shaker Bar Tool Set is aimed at the cocktail connoisseur. These pieces are perfect for displaying on your bar. Finished stainless steel, this set is elegant, durable and will never tarnish. Includes 3 piece cocktail shaker, double jigger, Hawthorne cocktail strainer, twisted handlebar spoon and mud. Overall Product Weight: 1.19 lb. Rated 5 out of 5 stars.43 total votes. Complete your home bar ensemble with essential design, perfect for any hostess. The perfect accessory for every outfit just got even better. Not only does the Criss Cross Bracelet Bottle Opener provide a subtle pop of bling, but it’ll pop the cap off of any bottle. Who said "always be prepared" had to be boring? Overall Product Weight: 0.09 lb. Preserve your wine in style with their colorful silicone Starburst Bottle Stopper - their smooth tapered sides allows for a secure fit. Why don’t all bottle stoppers work and look this good? Rated 4.5 out of 5 stars.88 total votes. Overall Product Weight: 6 lb. Whether you're between flights at your wine tasting or just keeping your favorite vintage fresh throughout the night, this charming bottle stopper has you (and your vino) covered. Made from iron and polyresin with rubber seal ribbing, this stopper is an ideal bar accessory, while its airplane design, gold finish, and decorative tag are sure to charm amateur pilots and wine-lovers alike. Measuring at 3.6" 2.3" x 2", this stopper perfectly fits into any drawer. Overall Product Weight: 0.17 lb. Rated 5 out of 5 stars.31 total votes. Introducing new Avante Embossed Stainless Steel Bar Tool Set. This bar tools set is perfect for your home bar or at parties. Designed with durability and elegance in mind, this set is constructed of mirror polished and heavy-gauge stainless steel. Each set includes an ice bucket with stand and tongs, 1 bottle opener, 1 cocktail strainer, 1 jigger and 1 bar knife. The Avante bar tools set will be a staple of your bar for years to come. Rated 4.5 out of 5 stars.176 total votes. An invitation to memories of great bottles and good company, Wine Enthusiast's cork catcher features a whimsical central cartouche that reads ‘Wine a little. You’ll feel better’. The vintage design is beautifully handcrafted in metal with an antiqued bronze finish. What makes it so special is its decorative charm and the nostalgic collage it creates as you toss your treasured corks inside. Overall Product Weight: 1.5 lb. The Man. The Myth. The Legend. Tan Hide Stitch Flask is a fun gift for any man, myth or legend you may know. The flask is made of stainless steel and is wrapped with a sturdy tan material and trimmed with white stitching. Personalize this flask with a name up to 15 characters for an added touch. Rated 4.5 out of 5 stars.11 total votes. Overall Product Weight: 0.81 lb. Rated 4.5 out of 5 stars.87 total votes. Overall Product Weight: 32 lb. Rated 4.5 out of 5 stars.177 total votes. Offering anything you might need to mix martinis, this five-piece bar accessory set— complete with an ice bucket, a cocktail mixer, tongs, a strainer, and a double-sided jigger— is a must-have addition to your entertainment space. These designs are crafted from stainless steel, so they resist rust and corrosion, and they must be washed by hand. If your at-home bar is already stocked with the essentials, this set is also a great gift for someone just starting to dip their toes into mixology. Rated 5 out of 5 stars.177 total votes. Crystal-clear ice spheres chill faster, dilute less and last longer than cubes can. Fill this ice ball maker with a chunk of ice and watch as it transforms into a perfect orb within minutes. Rated 4.5 out of 5 stars.68 total votes. Overall Product Weight: 1.6 lb. Rated 4.5 out of 5 stars.103 total votes. Overall Product Weight: 45 lb. Rated 4.5 out of 5 stars.39 total votes. Introducing a new Aura collection. This Aura Hammered Bar Tool Set is perfect for your home bar or at parties. Designed with durability and elegance in mind, this set is constructed of heavy-gauge stainless steel with a copper finish. Each set includes an ice bucket with stand and tongs, 1 bottle opener, 1 cocktail strainer, 1 jigger, and 1 bar knife. The Aura bar toolset will be a staple of your bar for years to come. Overall Product Weight: 2.273 lb. Rated 4.5 out of 5 stars.26 total votes. Overall Product Weight: 0.41 lb.